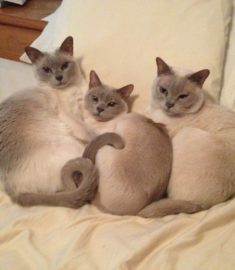 These are three of the sweetest cats I’ve ever had. I thought I thought I had plenty of time to have their cells preserved, but Hobbes died from a very aggressive cancer when we were out of town for less than a week. We had his cells preserved, but only after they had been frozen. We’ve had Calvin’s and Kant’s cells preserved and processed since then. I’m hoping we can enjoy all these cats’ company again after I retire.